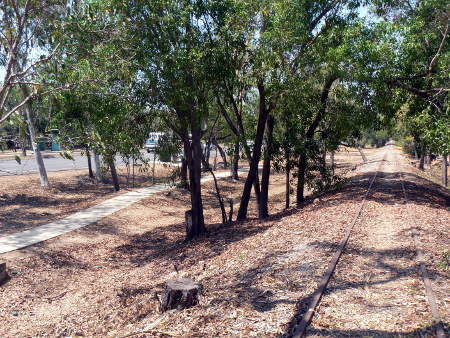 The original Darwin Railway was begun in the 1880's and eventually extended through Pine Creek and Katherine to Larrimah and Birdum Creek until it was finally closed in 1981. While the new rail link to Adelaide terminates at the new East Arm Wharf, the original line went all the way into the CBD to the Stokes Hill wharf and a purpose built iron ore loading wharf, with a passenger station located on the city doorstep. 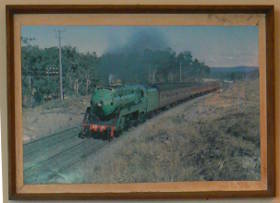 The line played an important part in opening up the Top End, helping in the development of the Pine Creek goldfields, iron ore mines at Frances Creek and agricultural development, as well as providing a passenger service. During periods of wet season floods there were times when the only access was provided by rail bridges over flooded rivers and creeks. It also provided vital transport during the second World War, connecting the airfields and army bases which were established in the defense of North Australia. At the end, extensive flood damage sustained in 1978 was responsible for the formal closure of the line. The Darwin Railway Club at Parap is still a funcioning social club, originally built to provide a facility for the railway workers. The map below shows the bus route which links the new Ghan Railway at East Arm with the Bus Transit Centre at Mitchell St in the City. 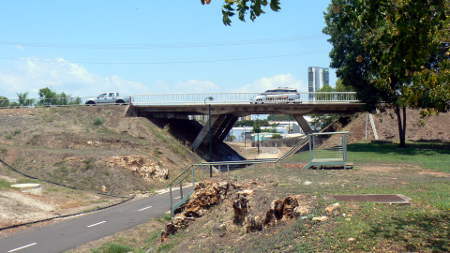 The original track followed close beside the Stuart Highway through Winnellie and Stuart Park, under the Daly St bridge, and on to Stokes Hill Wharf. 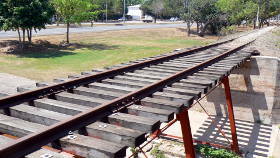 Click here to return from Original Darwin Railway to Enjoy Darwin home page.